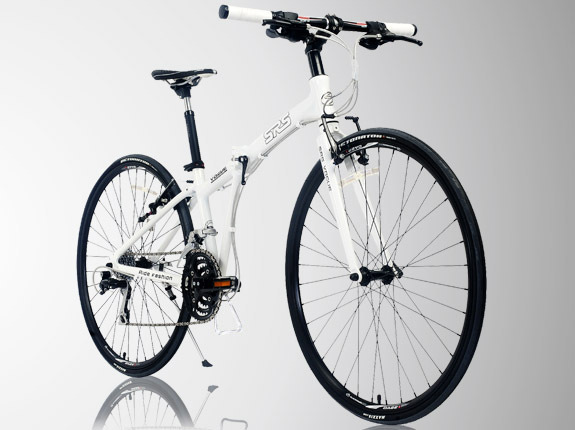 The symbol for fashion and individuality~ VOGUE; the all new SRS series VOGUE 700C road folding bike, its minimalistic styling incorporates futuristic design elements, it is the must-have bike for modern cosmopolitans. The VOGUE has achieved feather-light weight and high speed capabilities, sending the rider onto the most pleasurable road experience. The high-end SHIMANO transmission system offers a greatly rewarding ride. A combination of aluminum alloy 48/38/28 large gear plate and 700C road wheel set gives the VOGUE a heightened feel of sports quality. The multi-functional VOGUE’s seat suspension design offers extra comfort in both hill climb and road race circumstances. Breaking system is utilized with a lightened front fork, in conjunction with a stylishly intricate bike rack, the VOGUE emanates endless elegance and simplicity. FAX :+ 886-4-23127987 © SRS All Rights Reserved.